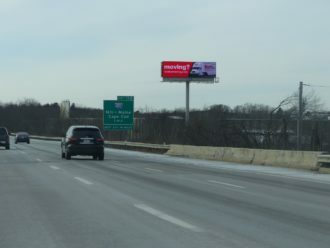 This digital board shows to traffic heading west on the Mass Pike, I-90, from Boston and suburbs in Metro West. This is the only high resolution digital board on the Mass Pike, I-90, in this area. There are no other billboards on the Mass Pike, I-90, on either side of the roadway for 14 miles past this unit. This assures advertisers that no competitive messages will be shown on other units. In addition, the long read time for this board assures high exposure for your message. This unit is a new build that is located only a few miles from the interchange between the Mass Pike, I-90 and I-495. This entry was posted by Laurie on Tuesday, March 7th, 2017 at 3:47 pm and is filed under . You can follow any responses to this entry through the RSS 2.0 feed. Both comments and pings are currently closed.